CLICK HERE TO PURCHASE SHOW TICKETS NOW & ALSO REGISTER AS A V.I.B (if applicable)! PRE-REGISTER ONLINE AS A V.I.B. (Very Important Bride or Groom) FOR EARLY SHOW ENTRANCE AT 10AM & BE ENTERED FOR A CHANCE TO WIN A LUXURY HONEYMOON courtesy of UNIGLOBE LGI TRAVEL! Click HERE for more prize details! Ticket price includes a Gift Bag, Lanyard, V.I.B. Weddings Magazine & Show Guide, Fashion Shows, plus Wine & Liquor Sampling and special treats in the Bride & Groom Lounges! Tickets are $18.00 including all taxes & fees. Weekend pass available for $23. Children under 12 admitted free when accompanied by an adult. Tickets are also available at the door. Be sure to select the date you wish to attend (Sat or Sun), tickets are good for one day only unless a Weekend Pass or ticket upgrade is purchased. ***Purchased the wrong ticket date? *** Don’t worry! No need to switch your ticket date! Tickets are good for either one day, Sat or Sun, no matter what date is on the ticket, but it’s valid for one entrance scan only. Already bought your ticket but want to upgrade it to a Weekend Pass? Bring your Saturday ticket to the Box Office at the RBC Convention Centre and upgrade for $5! Note: If you’re the Bride or Groom but someone else is purchasing your tickets they can simply register for you when they buy tickets through the “Register & Purchase Tickets Now” link above, OR you can also Register yourself without going through the ticket process by clicking here. After you complete your Ticket Purchase & V.I.B. Registration you will receive a confirmation email – this is your V.I.B. Registration confirmation, no other confirmation is needed. V.I.B.’s receive 10am Early Entrance (regular entrance is 11am). When you arrive at the show, go to the V.I.B. Registration Desk to receive your Free V.I.B. 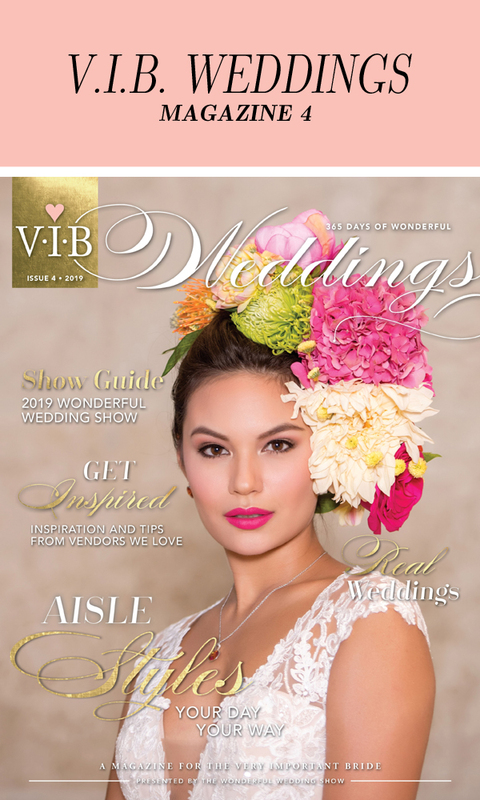 Weddings Magazine, Gift Bag & Lanyard (while supplies last), and get fast-tracked into the show. Only regular ticket purchase required for V.I.B entrance; no special or additional ticket needed. Your guests can enter the show early also! Guests will need to purchase a regular ticket but they don’t need to register, only the Bride or Groom needs to register. V.I.B Registration and Show Entrance is located on the 3rd Floor at the top of the escalators in the New South Building. Access to the South building is via the Skywalk adjoining the North building and New South Building, located just past the Centre Place Cafe. You can also park in the South Parkade (access via Carlton Street) and the elevator operator will bring you to the 2nd floor of the South Building.